While most activist shareholder resolutions this year have focused on pushing companies to reveal methane emissions, the Pittsburgh-based PNC Bank continues to face pressure from a Quaker group to eliminate any investment in mountaintop removal mining. It was the fourth consecutive year the Earth Quaker Action Team (EQAT) protested PNC’s financing of mountaintop removal mining. Outside of PNC headquarters, underneath the 2,380-square-foot Green Wall, EQAT members and activists announced their plan to attend the bank’s annual shareholders’ meeting, which was moved to Tampa. Last year, the EQAT disrupted the shareholders’ meeting by asking each PNC board member to publicly state his or her position on mountaintop removal mining. The meeting lasted 20 minutes. EQAT founding member Carolyn McCoy believes the bank is trying to distance itself from the Quakers, but she said the group will have its voices heard, despite the nearly 900-mile distance to Tampa. PNC spokeswoman Marcey Zwiebel said the bank is holding it's shareholders' meeting in Florida to celebrate expansion into the southeast. This is not the first time the meeting has left Pittsburgh. In 2011, it was held in Washington, D.C.
Mountaintop mining uses explosives to remove the tops of mountains, exposing coal. The coal is excavated in layers and placed into piles. The site is then re-graded and re-vegetated. McCoy said people living near mountaintop removal mining sites have “higher rates of mortality, lung cancer, and chronic heart, lung and kidney diseases” as well as higher infant mortality rates. In 2013, PNC provided $211 million in financing to Alpha Natural Resources and Arch Coal, according to a report by the Rainforest Action Network. Last month, Alpha Natural Resources was fined $27.5 million by the Environmental Protection Agency for more than 6,000 violations of the Clean Water Act. In a letter to new PNC CEO William Demchak, the EQAT is demanding “that PNC pass a full sector exclusion” policy when it comes to mountaintop removal mining. “That is a policy that would prohibit lending and investment and banking transactions for all companies that engage in mountaintop removal coal mining,” McCoy said. McCoy said these guidelines exclude virtually no company. 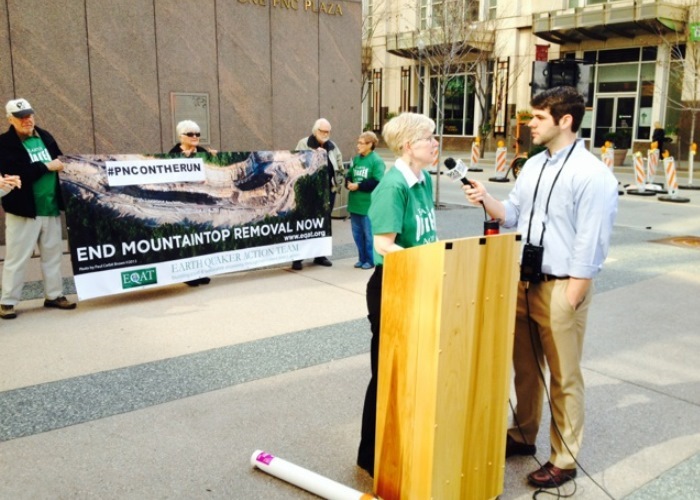 “PNC looks like a green bank and they know that being green is something that investors are concerned about and we really think it’s a small and very reasonable step for them to take to stop funding this most extreme form of mountaintop removal mining,” she said. Other banks have recently updated their policies regarding financial relationships with companies involved in mountaintop removal, EQAT said, citing JPMorgan Chase & Company as an example. JPMorgan Chase & Company's own documents, though, don't appear to go as far as the Quakers seem to be pushing PNC. JPMorgan Chase's Environmental and Social Policy Framework dated April 2014 states: "Coal production from mountaintop mining has declined by close to 50 percent since 2008 due to market conditions, regulations, and concerns over environmental and human health impacts. In 2013, we reduced our exposure to companies engaged in mountaintop mining. Going forward, we expect this decline to continue and exceed any decline in the overall market." McCoy said the EQAT will continue to protest until its demands are met. EQAT is also demanding PNC invest in sustainable economic development in Appalachia, where mountaintop removal mining takes place. 90.5 WESA is the NPR public radio station in Pittsburgh. The Allegheny Front works out of the WESA/WYEP studios.